Studies investigating the association between the apolipoprotein E (APOE) gene polymorphism and the risk of intracerebral hemorrhage (ICH) have reported conflicting results. We here performed a meta-analysis based on the evidence currently available from the literature to make a more precise estimation of this relationship. Published literature from the National Library of Medline and Embase databases were retrieved. Odds ratio (OR) and 95% confidence interval (CI) were calculated in fixed- or random-effects models when appropriate. Subgroup analyses were performed by race. This meta-analysis included 11 case–control studies, which included 1,238 ICH cases and 3,575 controls. The combined results based on all studies showed that ICH cases had a significantly higher frequency of APOE ϵ4 allele (OR= 1.42, 95% CI= 1.21,1.67, P<0.001). In the subgroup analysis by race, we also found that ICH cases had a significantly higher frequency of APOE ϵ4 allele in Asians (OR= 1.52, 95% CI= 1.20,1.93, P<0.001) and in Caucasians (OR= 1.34, 95% CI= 1.07,1.66, P=0.009). There was no significant relationship between APOE ϵ2 allele and the risk of ICH. Our meta-analysis suggested that APOE ϵ4 allele was associated with a higher risk of ICH. Intracerebral hemorrhage (ICH) occurs at an annual incidence rate of 15 to 19 per 100,000 . ICH accounts for approximately 15% of acute strokes in the United States and 22–35% in Asian populations [2–5]. ICH can be a devastating type of stroke, and the 30-day case mortality rate of ICH is 40% to 50%. [2, 6]. A pooled prospective study found that the risk factors for ICH were older age, African-American ethnicity, hypertension, lower LDL-C, and lower triglycerides . ICH has been shown to have important genetic and environmental risk factors. Apolipoprotein E (APOE) gene, located on the long arm of chromosome 19, codes for a 299-amino acid protein (apoE). ApoE is a polymorphic glycoprotein involved in cholesterol transport and cell membrane maintenance and repair [8, 9]. APOE has three common alleles: epsilon 2 (ϵ2), ϵ3, and ϵ4 that encode the three major isoforms of apoE: E2, E3, and E4, which performs isoform-dependent neurotrophic and antioxidant functions [8, 10–12]. Each person has 2 alleles that together compose that person’s APOE genotype (e.g., ϵ2/ϵ3 or ϵ3/ϵ3). APOE is one of the most widely studied genes in vascular and neurodegenerative diseases . Recently, some studies have been conducted to clarify the association between APOE gene polymorphisms and the risk of ICH [14–24]. However, previous studies investigating the association have reported conflicting results [25, 26]. We here performed a meta-analysis based on the evidence currently available from the literature to make a more precise estimation of this relationship. We used a detailed electronic search strategy in Medline and Embase from 1950 to the end of March 2013. Two authors independently searched the databases using following key words in all relevant combinations: ‘cerebral’ or ‘intracerebral’ or ‘intracranial’, ‘hemorrhage’, ‘apolipoprotein E*’ or ‘ApoE*’, ‘polymorphism’ or ‘allele’ or ‘genotype’ or ‘variant’. The search was conducted without limitation on language. The reference lists of all retrieved publications were scrutinized for additional studies. If studies had partially overlapping subjects, the smaller dataset was excluded. If necessary, we attempted to contact the principal investigators of retrieved articles to require additional data. The following criteria were used to include published studies: (i) independent epidemiological studies (for humans only); (ii) a clear description of APOE allele in ICH cases and controls; (iii) sufficient allele data were presented to calculate the odds ratio (OR) and 95% confidence interval (CI); Major reasons for exclusion of studies were (i) no control; (ii) not an original paper (e.g. review or letter etc. ); (iii) duplicate publications. Data were extracted by two authors independently, and disagreements were resolved by consensus. When a study did not explicitly report one or more of the requested data, we contacted the author of the study for additional details. The following data were extracted: the last name of the first author, publication year, country, study design, genotyping method, sample size and the results of studies. All analyses were performed using STATA 11.0 (Stata-Corp LP, College Station, TX, USA). The Mantel-Haenszel method for fixed effects and the Der-Simonian-Laird method for random effects were used to estimate pooled OR and corresponding 95% CI. 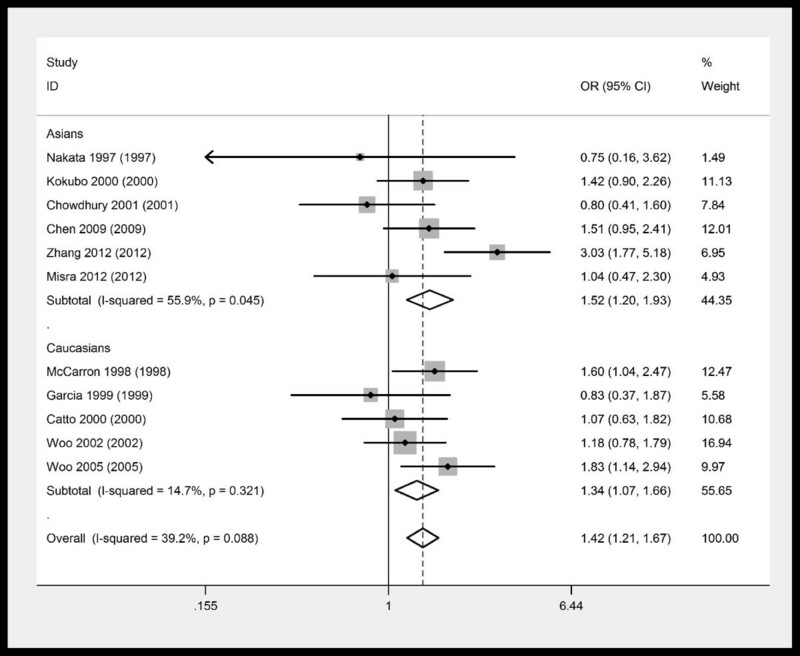 Meta-analysis heterogeneity was quantified by computing Cochrane’s Q and corresponding P-value and I2 (percent of effect size attributable to heterogeneity). We used fixed-effects methods if the result of the Q test was not significant. Otherwise, we calculated pooled estimates and confidence intervals assuming a random-effects model. Also, subgroup analyses were performed on the basis of race. In this study, P < 0.05 was considered statistically significant. 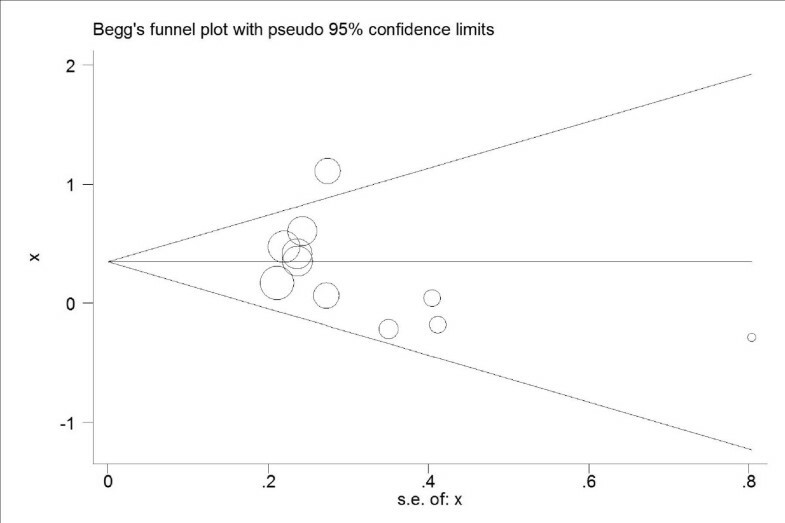 Publication bias was assessed by visual inspection of funnel plots, the Begg's rank correlation method and the Egger's weighted regression method. Characteristics of studies included in the meta-analysis are summarized in Table 1. Our initial search identified 108 studies according to the search words. Through the step of screening the title, abstracts, 85 articles were excluded, leaving 23 articles for full publication review. Of these, 12 were excluded [25–36]. Finally, a total of 11 studies were included in our meta-analysis [14–24], which included 1,238 ICH cases and 3,575 controls. Of those, three studies were population-based case–control studies, and eight studies were hospital-based case–control studies. Studies were conducted in USA, United Kingdom, Portugal, Japan, India and China. The frequencies of apolipoprotein E alleles of studies included in the meta-analysis were shown in Table 2. Abbreviations: HCC Hospital-based case–control, PCC Population-based case–control, DNR Data not reported, PCR Polymerase chain reaction, RFLP Restriction fragment length polymorphism. The combined results based on all studies showed that ICH cases had a significantly higher frequency of APOE ϵ4 allele (OR= 1.42, 95% CI= 1.21,1.67, P<0.001) (Figure 1) (Table 3). In the subgroup analysis by race, we also found that ICH cases had a significantly higher frequency of APOE ϵ4 allele in Asians (OR= 1.52, 95% CI= 1.20,1.93, P<0.001) and in Caucasians (OR= 1.34, 95% CI= 1.07,1.66, P=0.009) (Figure 1) (Table 3). There was no significant relationship between APOE ϵ2 allele and the risk of ICH (Figure 2) (Table 3). Meta-analysis of APOE alleles and ICH (ϵ4 versus ϵ3). Meta-analysis of APOE alleles and ICH (ϵ2 versus ϵ3). Statistical heterogeneity was not found among studies in overall comparisons by using the Q statistic (Table 3). 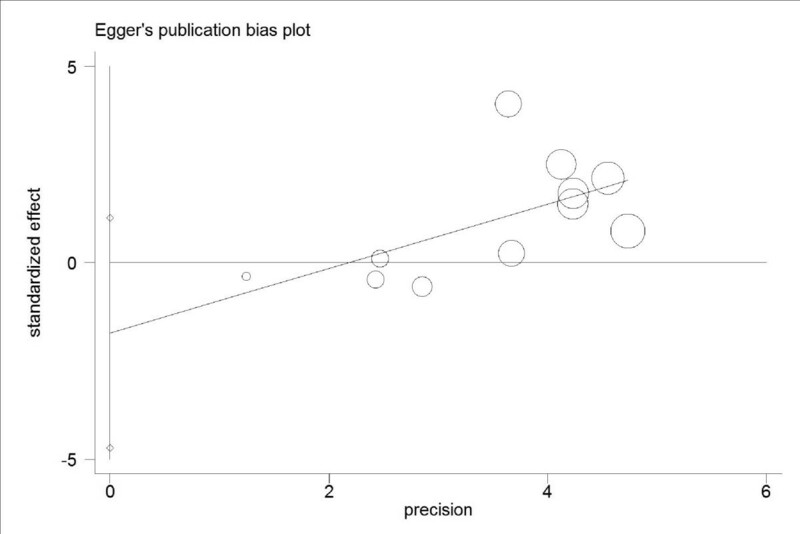 Publication bias was not found by the Begg's rank correlation method (Figure 3) or Egger weighted regression method (Figure 4). Begg’s publication bias plot of APOE alleles and ICH. Egger’s publication bias plot of APOE alleles and ICH. There is evidence for a role of genetic factors in the development of ICH. Studies investigating the association between genetic polymorphisms and ICH risk are being reported with rapidly increasing frequency. Endoglin gene polymorphism was a risk factor for sporadic ICH . A comparative study that angiotensin converting enzyme (ACE) gene DD homozygosity of the I/D polymorphism in intron 16 is an independent risk factor for ICH in a Polish population . A case–control study suggested that the beta1-tubulin Q43P polymorphism could be associated with ICH in men from southern Spain . A population-based prospective nested case–control study found that estrogen receptor alpha gene polymorphisms were associated with first-ever ICH, particularly in combination with hypertension . A case–control study found that glutathione peroxidase 1 C593T polymorphism was associated with lobar ICH in a Polish population . A case–control study suggested that the rs2228048 of TGFBR2 gene may be associated with development of ICH in Korean population . A study suggested that the rs17222919 of ALOX5AP may be associated with the development of ICH in Korean population . The APOE gene polymorphisms are associated with many other diseases. A meta-analysis showed that APOE ϵ4 allele appeared to be associated with a higher prevalence of dementia in Parkinson disease . A meta-analysis suggested that the APOE ϵ4 isoform was a genetic factor that might influence the age at onset of temporal lobe epilepsy . A meta-analysis showed that the APOE ϵ4 allele was associated with an increased risk of developing hypertension . A meta-analysis found that the APOE ϵ4 allele was associated with a moderately increased risk for progression from mild cognitive impairment to Alzheimer's disease-type dementia . Prevalence of APOE ϵ4 alleles was significantly higher in patients with coronary artery disease than controls . The exact mechanism of the association between APOE polymorphism and the risk of ICH remains unclear. APOE plays a critical role in redistributing lipids among central nervous system cells for normal lipid homeostasis , repairing injured neurons , maintaining synaptodendritic connections , neurite outgrowth , synaptic plasticity , mitochondrial resistance to oxidative stress , and glucose use by neurons and glial cells . Compared with ϵ3/ϵ3, ϵ4 allele-containing genotypes are associated with increased total cholesterol levels . It appears that the ϵ4 allele enhances amyloid deposition in blood vessels . Thus, one might expect ϵ4 carriers to have increased susceptibility to ICH, especially in a lobar location. Furthermore, APOE ϵ4 allele was also associated with an increased risk of developing hypertension , which may be the reason that APOE ϵ4 allele was associated with a higher risk of ICH. Several limitations of our meta-analysis should be noted. First of all, meta-analysis is powerful but also controversial-controversial because several conditions are critical to a sound meta-analysis, and small violations of those conditions can lead to misleading results . 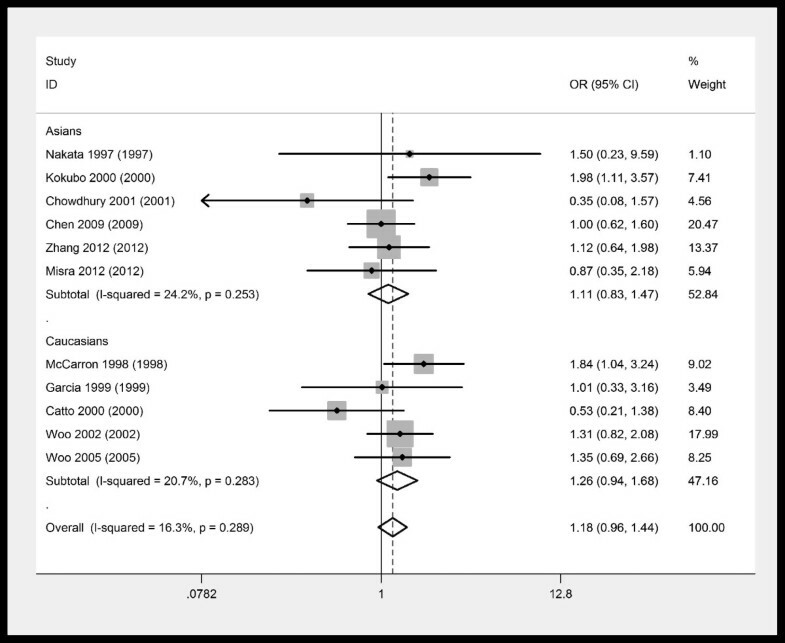 Second, relatively small sample size of studies in overall comparisons was observed in this meta-analysis. The results of small meta-analyses should be regarded with caution, even if the P value shows extreme statistical significance . Thirdly, because of the lack of individual patient data, we could not perform an adjustment estimate. In spite of these limitations, our meta-analysis also had some advantages. First, the major strengths of the meta-analysis are that we used a comprehensive searching strategy based on computer-assisted and manual searching which allowed the eligible studies to be included as far as possible. Second, no heterogeneity or publication bias was found, which leads to a possibly robust result. In conclusion, our meta-analysis suggested that APOE ϵ4 allele was associated with a higher risk of ICH. Future studies will be required to clarify the biological implications of our findings. The study was supported by grants from the national key Technology R&D program for the 12th Five-year plan of P.R. China (2011BAI08B05). RJZ, XFW, ZCT, JXL, SZY and YBZ carried out the search studies and drafted the manuscript. YJW, WYL and JW, participated in the design of the study and performed the statistical analysis. JLL, BBC and KHZ conceived of the study, and participated in its design and coordination and helped to draft the manuscript. All authors read and approved the final manuscript.